Most CFOs would make world-class jugglers. Not that we’re suggesting any drastic career changes for our CFO friends but, if you think about it, the comparison makes an awful lot of sense. An effective CFO is one that always has many balls in the air, each requiring a very particular skill to keep them all properly afloat. Put another way, a CFO and their finance department must be able to foresee the future, multitask with the best of them, adeptly handle relentless variables, and provide direction to many people moving in scattered directions. Wouldn’t it be nice to automate some of that juggling? Embark thinks so. That, of course, is precisely where robotic process automation (RPA) enters the picture, a glass of sunshine for CFOs and their finance departments that too often have a world-weary, slightly forlorn look on their collective face in the midst of those endless internal and external variables. To put it another way, RPA allows CFOs and finance departments to evolve as the market dictates, becoming the forward-looking drivers that continually guide an enterprise along a growth-oriented path, even when those variables have other ideas. By automating key processes, RPA analyzes data faster, closes the books sooner, and is far less prone to error than its human counterparts, freeing valuable resources for CFOs to concentrate on their many other responsibilities that add value and expand market share. 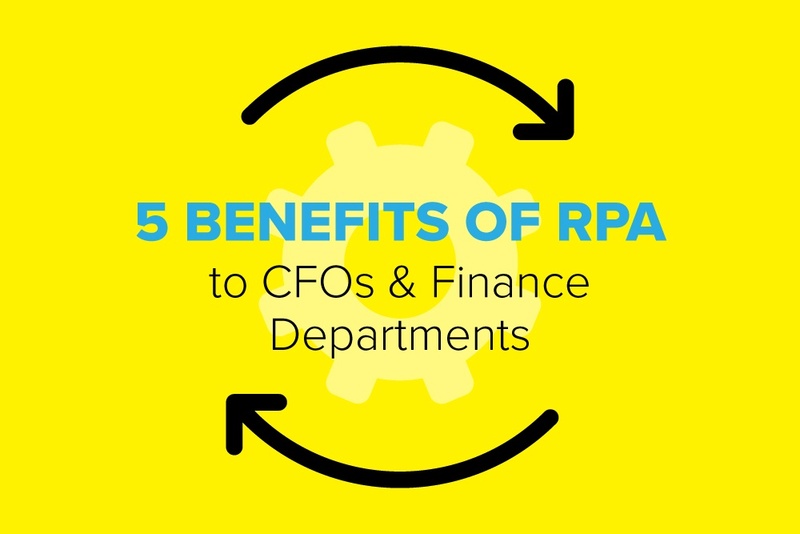 Take a look at just a few of the benefits RPA provides CFOs and finance departments, marvel at its splendor, and evaluate where it would fit into your own enterprise. Time is of the essence in such a fast-paced environment, where quick but sound decision-making can directly lead to a significant leg-up on other market participants. Therefore, the sooner an enterprise implements effective solutions, the better. With insightful guidance and a can-do attitude – nudge, nudge, Embark overflows with both – RPA can automate processes in a matter of just a few weeks. Gone are the days where staffing has to bust at the seams and labor costs explode when workloads spike. Companies can scale RPA to changing needs, efficiently expanding it when demand surges, and scaling it back when tides return to normal. For seasonal operations or even just a continuing effort to free resources and foster innovation and insight, RPA provides a company flexibility in a market that rewards such traits. When properly implemented and maintained, RPA bots are a tireless component of a workforce that don’t need bathroom breaks, lunch, or even sleep for that matter. They work 24/7 on processes that are often tedious, repetitive, and susceptible to human error, increasing the accuracy and reliability of data with minimal maintenance. Of course, Embark can help you establish the necessary procedures to make sure your RPA army is always functioning at peak levels. All in all, RPA streamlines and optimizes your finance processes to improve overall quality and reduce your costs. Busy schedules and overwhelming workloads make outsourcing particular functions a tempting but harrowing thought. There’s something to be said for keeping everything in-house, under an enterprise’s vise-like control, and away from the prying eyes and tuned ears of the outside world. However, before the introduction of RPA, organizations were often left no choice and forced to outsource certain processes, mostly due to the costs involved in trying to increase staffing to perform those functions in-house. RPA eliminates that dynamic, allowing companies to expand in-house abilities and meet work demand entirely within their own teams or, more concisely, RPA provides the best of both worlds. By implementing RPA, enterprises save the costs that otherwise would’ve been devoted to outsourcing while also maintaining absolute control of their data and processes. The importance of competitive advantage in a crowded, turbulent environment is difficult to overstate. Any benefit in cost, time, or innovation can be the difference between lasting success and struggling to stay afloat. RPA provides enterprises with efficiencies that directly correlate with such advantage, making it a valuable tool in a company’s revenue-inducing, market share-expanding bag of goodies. Short payback periods from low integration costs mean recovery time is slim and benefits robust when companies apply RPA to existing applications that scream for automated efficiency. It’s the sort of ROI that CFOs daydream about when the coffee has run dry and days seem like they’ll never end. RPA bots will never wake up on the wrong side of the bed, have a toxic case of the Mondays, or let a lousy draft for their NBA team obliterate productivity. Bots enable far higher levels of quality and consistency in output, bridging gaps in data between separate groups, departments, logs, and sources to improve an enterprise’s ability to identify and address compliance issues on an ongoing basis before they wreak havoc. When properly integrated into the IT corridor of compliance, RPA stays in its lane, always signals before exiting the freeway, and safely gets an organization to its intended destination.